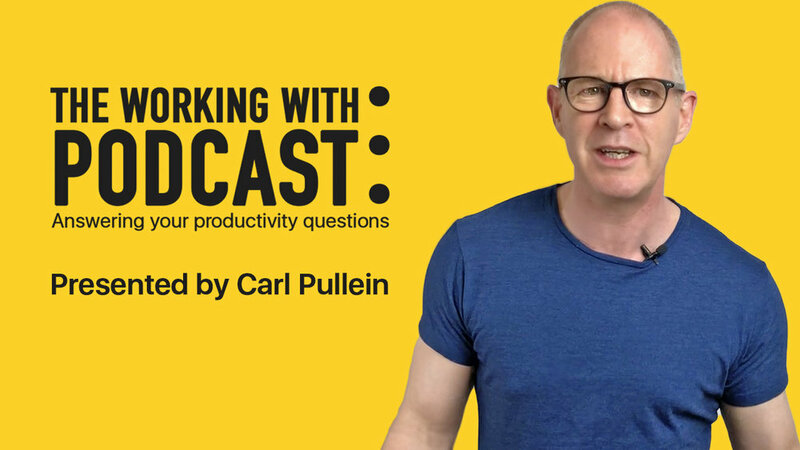 In this week’s episode of the Working With Podcast, I answer a question about how to make sure you work on the things that matter. NEW! From Disorganised to Productivity Mastery in 3 Days! Hello and welcome to episode 52 of my Working With Podcast. A podcast created to answer all your questions about productivity, GTD, time management, self-development and goal planning. My name is Carl Pullein and I am your host for this show. In this week’s episode we will be discussing what matters most and to make sure you are staying focused on those things and not getting caught on a conveyor belt of meaningless tasks that take you nowhere. But before we dive into this week’s question, I’d like to point you all to a video I did on my YouTube channel about starting your 2019 plan. In that video I take you through the annual planning process I go through each year and it always starts in October. So, now’s a great time to watch that video and to download my annual planning sheet to help you get the most out of 2019. I’ve put a link in the show notes for you. Okay, so let’s get to this week’s question and that means it’s time for me now to hand you over to the mystery podcast voice for this week’s question. This week’s question comes from Patricia. Patricia asks “I work for an import/export company and every day the workload is huge. I never have time to do work that I want to do because I always find myself having to deal with other people’s emergencies. Do you have any tips that will help me to do more of my own work and less of other people’s? Excellent question, Patricia and another question I think many people have. How do you focus on your own work and priorities when customers, colleagues and bosses want you to work their priorities? And really that’s the problem here. All that work we get dumped with is often work for other people and in many ways, the simple solution is to set some boundaries to prevent it from happening. Of course, simple solutions are not always easy solutions. So let’s see what can be done. Sometimes we are our own worst enemies. When we start a new job or we gain a new client we are all too eager to please, so we say yes to everything. The problem with that is once you start saying yes to doing ‘extra’ work that ‘extra’ work becomes the norm and soon your colleagues, boss and customers just expect you to do it. In essence, that extra work has now become your regular work. We can blame other people, but the reality is we accepted that work before and now it going to be much harder to say no. Now your colleague is going to walk away and ask someone else to do their work for them. What you are doing here is showing you are willing to help, but at the same time making it clear your work takes priority. You colleague will get the message. Bosses are a bit more difficult because they have seniority. But the same strategy can be used. If a boss insists, what you can do is ask them which work can be delayed so you can work on their slides. This has two effects, it causes the boss the stop and thinks about what they are asking you to do (work outside your scope) and now if the boss insists they will have to reprioritise your work, this giving you extended deadlines on your own work. Either that or, like you colleague they will do their own work themselves. Handling customers is the most difficult, but here I have found that what we tell a customer at the beginning is very important. If a customer begins calling you after your working hours for example, no matter how tempting it may be to answer your phone or reply to their email late at night this is something you must not do… Ever! When you answer your phone, reply to a text message or email after your working hours you have told your customer you are willing to work extra hours for free for them and they will take full advantage of that. The best way to handle this is to call them back at 7 AM or send your reply at 6AM—I often use my email scheduling feature and reply to the email before I go to bed and then schedule it to go out at 6:10 am. This tells your customer you are diligent, but it also tells them, you will not be replying to their email late at night. I’ve found sending my replies very early in the morning sends a very powerful message. I can promise you they will not be expecting you to reply after hours again AND… They will not be calling you late at night because they don't want to be woken up at 7AM the next day. It’s really all about setting boundaries and expectations. If you make yourself available at all times, then your colleagues, boss and customers are going to expect that always. Not a good place to be in if you want to make time to prioritise your own work. Now how to manage an overwhelming workload. Here you are going to have again set yourself some boundaries. The first I would suggest you do is to learn when you in your peak working state. Everyone will be different here. For some of you, early morning will be when you can focus deeply on your work and get a lot done, others of you may find the afternoons are better. I always believed I was a night owl and so I used to do my focused work late afternoon or early evenings. But after I took some time to experiment doing my work at different times of the day I discovered I worked in a much better mental state between 6AM and 9AM. So now that is the time I turn off all my devices except for the ones I am using to do my work and I get on with my work. Now it is important to plan what you will work on the day before if you do not plan what you will work on you will find you spend the first 30 mins or so trying decide what to work on. That’s not a good way to start. Before you finish for the day, make a decision on what work is your priority and needs pushing forward and write that down at the top of your to-do list for the next day. That way when you start your focused work time, you can get straight into it. Its also important you put your phone, tablets and computers into a “do not disturb” mode for this period of time. Don’t worry, nothing bad will happen… I promise you. I’m not sure if this is possible with Android devices, but on iPhones when you turn on do not disturb, you can allow those people on your favourites list to get through. I do use this function, but the only people on my favourites list are my wife and mother. If anything bad was happening, my wife and mother would be the first to tell me. For me, I can do 3 hours of focused work before my brain is tired and I need a break. During that break, I will get up and move, but afterwards, I will do things like check email, basic admin tasks and other less mental tasks. The key to all of this is to decide the day before what it is you want to get done the next day. If you don’t do that you will get caught up in the day’s crises. But, and this is a big but, do not be tempted to schedule too much. You are always going to get distracted and some those daily crises will involve you. If you try and plan out eight hours of priority work in one day you are never going to get it all done. There’s no flexibility. You should be aiming for two to three hours of focused work and make sure you are not disturbed during the time you have allocated to do that work. Talking to your boss about your new focused time period will also help. When you explain to your boss you want to get more quality work done and you need two to three hours a day where you can work undisturbed, your boss will understand and be sympathetic. I’ve found that once you explain why you want this undisturbed time and you show your boss the amount of work you are getting done and the higher quality, your boss will very quickly give you more freedom to do more focused work. I know it’s hard to say “no” to colleagues, customers and your boss. But you are not really saying “no”. You are still doing your work, but you are doing your work on your terms and on your timeline. These boundaries are important if you want to have a better working experience and want to feel less stressed and overwhelmed. The bottom line is, nothing will change unless you change. And that means you need to take control of your time and your priorities. If you allow other people to control your time and your priorities you are always going to feel overwhelmed and stressed. So, Patricia, start be setting some boundaries and make sure you are very clear about what you want to get accomplished tomorrow. Find out when you are in your peak working state and schedule some focused time to work on YOUR priorities during that period. By just working on those things, you will very quickly find you feel less stressed and overwhelmed. Thank you for your question, Patricia and thank you to you all for listening to the Working With… Podcast. Don’t forget if you have a question you would like me to answer, just email me carl@carlpulein.com or DM me on Twitter or Facebook. All the links are in the show notes.